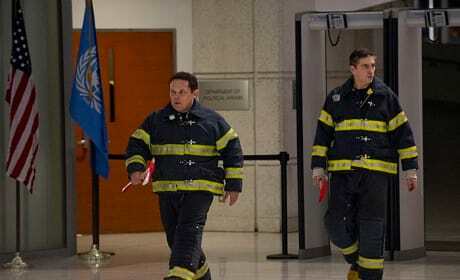 Fusco and Reese are on the scene in this Person of Interest photo. It is from the episode "Allegiance." Finch and Reese get the number of an ex-governor contractor on Person of Interest. "Allegiance" is the 18th episode of the show's third season. What's our ETA on Captain America? Permalink: What's our ETA on Captain America? The Machine has alerted me that our elusive adversary is back in town; eliminating him might be our last opportunity at stopping Samaritan.